I've been meaning to replicate an amazing dish "Ocean Trout tacos" that I had tried at Big Stone. 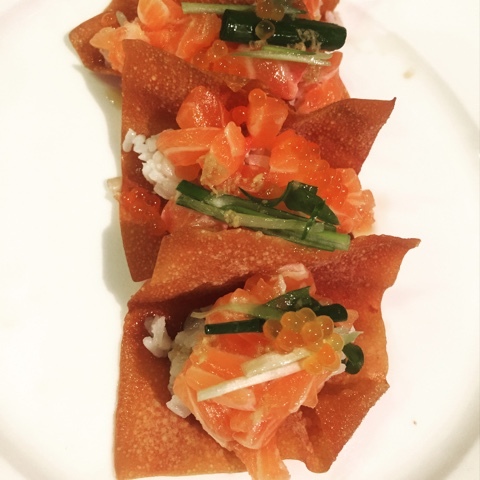 I had wondered how they made the taco shell which was so crunchy and delicious combined with the rice and sashimi grade ocean trout was a taste explosion I wanted to have all over again. Whilst making deep fried dumplings for the kids a few nights ago, I realised the tacos were made from egg wonton wrappers. With this in mind, I was determined to make this dish. Heading down to the Sydney Fish Market, I found that the deboned, skinless Huon salmon was on special and spotting the Huon Salmon caviar on the shelf would add to that extravagance for this dish. I loved this dish and so did the kidlets. These were so good and being eaten as fast as I could make them. A delicious tasty dish that I will certainly be making again soon. 1. Prepare rice by mixing with sesame oil and salt. Roll into long 5cm long logs and set aside. 2. Prepare the salmon, cutting into thin half centimetre slices and then into small cubes. Set aside in a bowl. 3. Make the sauce by combining all the ingredients of vinegar, soy sauce, mirin and grated ginger. 4. Place 2 cups of oil into a wok and place on medium high. (Pointing a wooden chopstick to the base of the heated oil in the wok, when the bubbles rise instantly, you know when it is ready). 5. Place 4 wonton wrappers into the hot oil. As these cooking away, place the tongs in the centre to create a slight depression to give a bowl like appearance. This will be handy when putting the tacos together. 6. Place the cooked wonton wrappers on a plate and add the rolled rice logs. 7. Place a good amount of Huon salmon on top of the rice. 8. 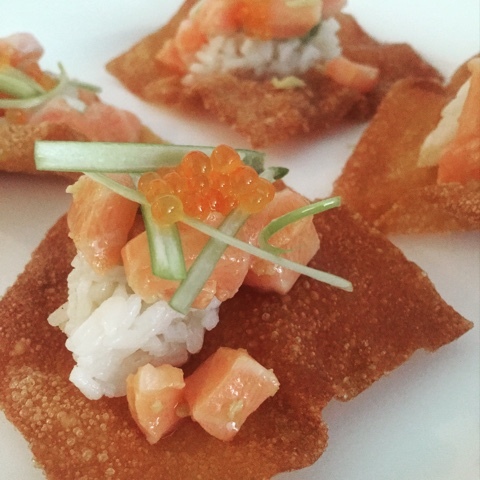 Garnish with thinly sliced spring onion and salmon caviar. 9. Sprinkle a teaspoon of sauce on top just before serving. What to do with leftover rice? With the leftover rice, I use sandwich bags and fill this to a handful size to place into the freezer and have rice ready to use at a moment's notice. Place the unwrapped frozen rice into a bowl in the microwave with a dash of water and place on high heat for 3 minutes to get lovely soft rice instantly. You can find Tasmanian Huon salmon caviar 100g for $15 at De Costi, Sydney Fish Markets. You can also use Ocean Trout fillets or Huon salmon deboned and skinless.